The hash size has now been changed to 1 gb to enhance the search depth of Houdini. Here is your top ten. Kingfighter and then Rotat 7 has been eliminated. The PGN file I will upload at the end of the tournament will be of the top 10. Still tons of matches to be done. Current scores might look misleading because not all engines have played the same amount of games. First aim is for 54 games each, I'll extend it if the margins are too small. Some shuffling of books, it's still anybody's game at this point. Gnurt falls to last place. This is where I double-down on the matches and we get a lot of matches between books to try to establish a more reliable statistic. I'll keep this going as long as I feel more games are nessesary, and more games are definately nessesary at this point. The points are way too close to crown a winner with any form of certainty. Thanks for your hard works. 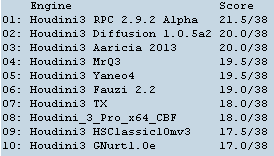 Wow this old RpC 2.9.2A is still on top. I have some newer private RpC books. But i need his permission before i send you links. Can not contact with him for months. Thanks for your interest. Yes, some of the old book makers have been out of the loop for one reason or another. Hope RPC returns soon. I did a lot of testing for him in ABk Book Bash II. Well for quite a while Fauzi was on top but during the last few days the standings took a tumble, goes to show it's still anybody's game at this point. Guess it makes the tournament more interesting, lol. I have some surprises for those interested on my next update. Just wait and see. I'll try to get the games out faster to get the update in on time. I just realized I double posted, lol. The newest versions of RPC and Diffusion are now in and I've been busy doing games for them. The newest RPC threatens to take first place as it has a winning winning ratio. (That was an awkward phrase). I had to redo games for these two, took a long time, I've had the computer firing for hours on end now to try to get it in quickly. 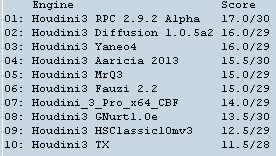 All games since a few days ago running only on 1 gb hash, none of the 10mb nonsense to ensure deeper search depth! Sure, it lowers my nodes per second but what matters in the end isn't showing off computer speed but achieving that deep ply count to get the tournament the way it ought to be! Great, been sitting here for half an hour trying to get the hash to work. Arena is sooooooooooo0o0o0o0o glitchy it's almost unusable. Now I can get back to testing. Next round will be done today or tomorrow. Cheers. I wish some third party would pick this up and update it... at least fix the glitches in it. Fauzi takes back first place. Grrr, my friend's 8350 is faster for chess than my 4770k because although its 8 cores are much weaker core per core, it's still 8 cores. I'm guessing a good 10-15% faster. :( I get better gaming performance though. Anyways, 7 rounds are done. which one is Houdini without book ? the CBF one? 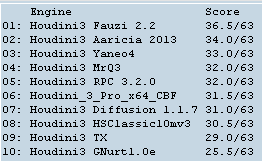 and how much does the KNPS of houdini reaches in Your friend 8 cores pc ? 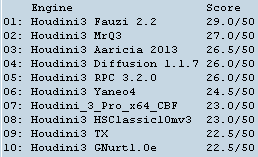 Yes, Houdini 3 Pro x64 CBF is without book. Friend's 8350 reached a speed very close to my 4670k, but mine is overclocked already and his isn't. It's amazing how strong Houdini without a book is. 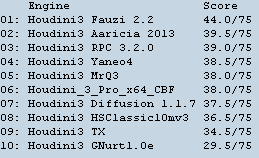 Between stockfish and Houdini looks like I have a lot of testing to do for different opening books. 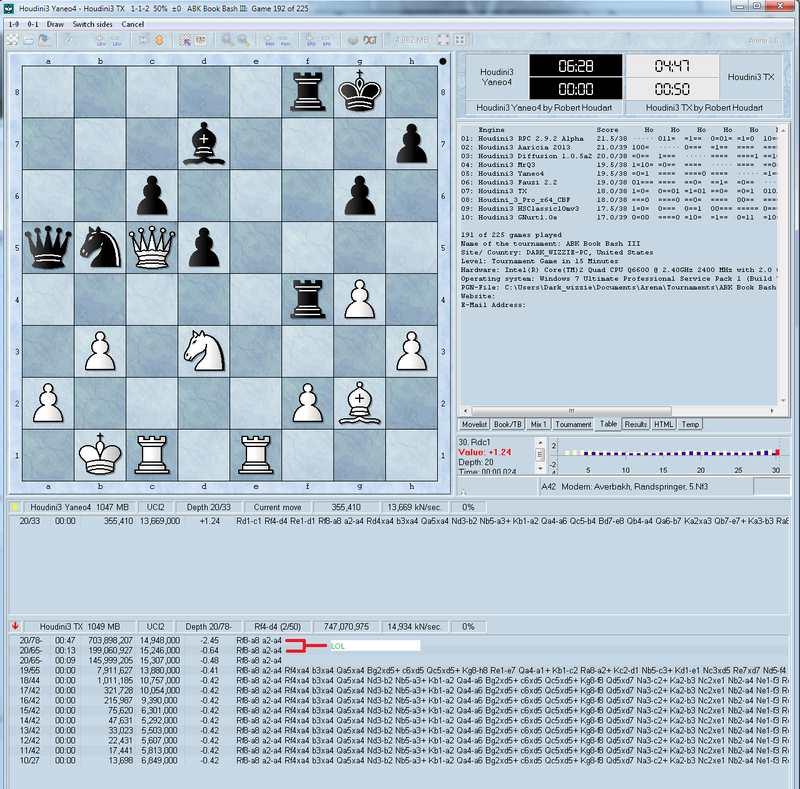 I only have one powerful computer, I can only do so much by having it running chess when I'm not gaming. Today ABK Book Bash III ends. Fauzi 2.2 is the winner. Throughout testing Aaricia led but Fauzi took over, then Diffusion, then Fauzi came back to cement the winning position. Congrats to Fauzi. Perhaps there will be an ABK Book Bash IV in the future, maybe CTG Book Bash I, or some other test, I'm not sure. Not too interested in Houdini vs Stockfish tests as there is no way I can generate enough statistics for my work to be worth anything. CCRL do hundreds upon hundreds of tests on 40/40 and I can't do as much work as their team can spit out. Just refer to them for elo lists. I'll stick to books. Keep in mind this was a 15 minute time control, doing this took three times longer than the ABK tournament hosted by that other guy a year back. Thanks for following the tournament up until now, stay classy. Little extra picture for you folks. Above is the standings if I include the lower-rated books originally used in the tourney but since then eliminated. Statistics show 677 games run, or 248 hours of computing! 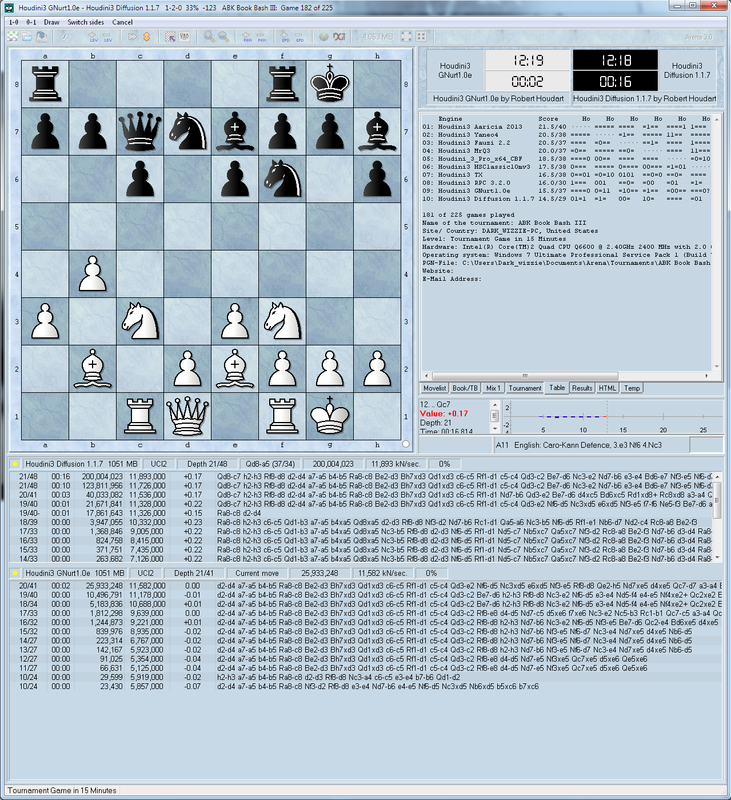 I wanted to let my latest book Fauzi 2.6.abk challenge the winner of the tournament in a 1 vs 1 as a sort of Grand Final, but since The winner is an old version of the same book I am not sure anymore, but if You are interested in running a test between Fauzi 2.2.abk vs Fauzi 2.6.abk to see the improvement of the book let me know Dark Wizzie. anyway thanks for running this beutiful tournament , it have been long time since .abk tournaments was played in here, and thanks for the congratulations , it makes me proud. Fauzi asks the guys "where is my book Tournament standing?" @peekoo wrote: Fauzi asks the guys "where is my book Tournament standing?"